Does a hidden ball trick work if the baseball hides in a pocket? Such is the question prompted by a comedic Astros antic in Milwaukee on Sunday. The Play: With one out and none on, batter Chris Carter hits a double to left field, fielded by left fielder Preston Tucker and thrown back to infielder Jose Altuve. 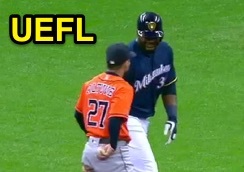 As Altuve walks past batter-runner Carter standing on second base, he places the baseball behind his back and into his pants pocket. Carter remains on the base and Altuve subsequently retrieves the ball and throws it back to pitcher Dallas Keuchel. Question: Using professional rules (and foregoing common sense, if applicable), what should 2B Umpire Tom Hallion's call have been if Carter, duped by the hidden ball trick, stepped off of second base and was tagged with the ball by Altuve? Answer: The play is not specifically covered by any one particular rule, but we can piece together several points of information to adjudicate this play. Common sense likely dictates calling "Time" and placing the runner back at second base. Forgoing common sense, however, leads us to the issue of whether a fielder can place a live ball in his uniform pocket and subsequently retrieve the ball to tag out a runner. MLB Umpire Manual interpretation "Ball Going Into Player's Uniform" states, "If a batted or thrown ball inadvertently goes inside a player or coach's uniform...the umpire shall call 'Time.' He will, using common sense and fair play, place all runners in such a manner that, in the umpire's judgment, will nullify the action of the ball going out of play. In no case may any outs be recorded on such play." Although this is decidedly not a case of an "inadvertently" created situation, the ball nonetheless is dead (defined as "a ball out of play") at the moment it goes inside the player's uniform pocket. Accordingly, we take stock of the situation at the moment the ball becomes dead: The runner is standing on second base not intending to advance; accordingly, the proper call is to place the runner on second base and resume play with one out and one on. Note that this play does not involve a detached uniform piece or equipment, as in Rule 5.06(b), which means the base awards for a batted or thrown ball do not apply. Nor does this play involve a pitched live ball becoming lodged in catcher paraphernalia, meaning the associated base award does not apply. Pursuant to UEFL Rule 4-5-b, this Case Play discussion remains open for 48 hours and is worth 1 point.